The Union Cabinet on Wednesday approved the first-ever three-way merger in the history of Indian banking with the amalgamation of state-owned Vijaya Bank, Dena Bank and Bank of Baroda (BoB). "There will be no impact on the service conditions of the employees and there will be no retrenchment following the merger," Union law minister Ravi Shankar Prasad said. BoB also finalised the share swap ratio for merger of Vijaya Bank and Dena Bank with itself. As per the scheme of amalgamation, shareholders of Vijaya Bank will get 402 equity shares of BoB for every 1,000 shares held. In case of Dena Bank, its shareholders will get 110 shares for every 1,000 shares of BoB. 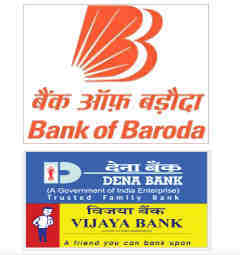 The government in September last year had announced merger of Vijaya Bank and Dena Bank, with larger peer BoB. The merged bank will become the country's second largest public sector bank (after SBI) and will "help create a strong globally competitive bank", the government said in a statement. The merger will come into force on April 1, the statement added. Scrip of Bank of Baroda closed at Rs 119.40, down 3.16 per cent on the BSE. Vijaya Bank shares closed almost flat at Rs 51.05 apiece on BSE, while that of Dena Bank at Rs 17.95.